Manu Chandra is the chef partner, responsible for the hugely fun and first of its kind Gastropub brand – Monkey Bar in Mumbai, Bangalore and Delhi; the trendy Asian Gastro Bar The Fatty Bao in Mumbai, Delhi and Bangalore and more recently Toast & Tonic – the East Village inspired International restaurant and bar in Bangalore. 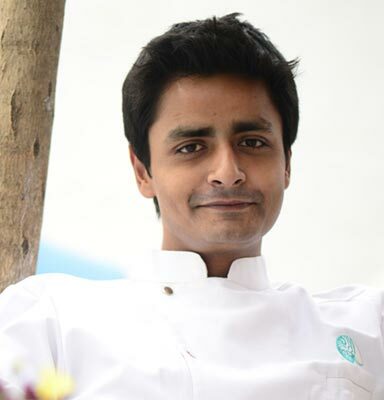 He is also executive chef of the much-acclaimed Olive Beach in Bangalore. Manu’s passion for food surfaced at a young age, thanks largely to a foodie family. Food, the cooking of it, the discussions and arguments around it, and most importantly the celebration of it, were so integral to his family’s normal functioning that it was hardly a surprise when he opted for it professionally. At St. Stephen’s College, as an under-grad, he wrote, designed and helped photograph a book on fusion cuisine. Manu then enrolled at the Culinary Institute of America (CIA) Hyde Park, New York, where he apprenticed with some of the City’s most celebrated kitchens, including Restaurant Daniel, Le Bernardin, Gramercy Tavern, Café Centro, Jean Georges and Town and also opened the now legendary Mandarin Oriental Hotel in Manhattan. A lover of slow cooking, Manu leans towards painstakingly controlled and cooked things, a process that enables one to extract flavours and textures. On the flip side, he’s fond of incredibly fast cooking, which keeps the integrity of ingredients and freshness intact. A minimalist, he believes that removing an ingredient rather than adding one usually improves the flavour of a dish.